Founder of Centering on Children, Ron serves as the eagle eye over the business, making sure all the parts are in place to keep our workshop running smoothly. Along with Linda, he provides the heart of the business, and acts by the mission of bettering the lives of all touched by ShoeboxTasks - central to COC's founding principles. Otherwise, Ron enjoys keeping up with what’s happening with his two sons and grandson, hiking, gardening, art appreciation, traveling, reading (at present all written by Japanese writer Murakami), listening to tree frogs' nightly songs, writing when spirit moves him, and getting together with friends over food and drink. Linda acts very much as the creative force behind the business and, along with many of her other life endeavors, it has motivated her in three of her overarching goals and interests: finding a way to champion the underdog; remaining curious and idealistic; and earning a living while approaching it all as art. She is grateful to be a steward of the company while being of service to the greater community and showing appreciation for the individuals involved. Apart from helping to craft this business, she creates visual works of art--primarily oil paintings, and has shown her work at galleries across the United States. Grace is in charge of the daily operations of the shipping department at Centering on Children, and helps keep our employees on the spectrum (and their job coaches) on task. She has an uncanny knack for remembering numbers and doing calculations in her head, and can be counted on for knowing unlikely details about many, many random things. When not at COC, she busies herself being a mom, working for her cousin's moving business, and writing novels. Vanessa is our Operations Manager. Most days, she's busy putting her mad organizational skills to work in a multitude of ways that keep us running like a well-oiled machine - which is quite a challenge when there are so many moving parts in the Tasks themselves, as well as the business overall! She is also a skilled website designer (she designed this site) and runs her own non-profit organization, HADAYA, focusing on support for refugee children, mainly through books and balls. Aside from being British and amusing us with her English-isms and accent, Vanessa is also a multi-media artist, enjoys photography, nature and hiking with her side-kick Mac (an Australian Terrier). in charge of processing all orders and keeping tabs on the inventory of the many components that make up our Tasks. Her main passions include travel, hanging out with her three kids, and eating--donuts and Southern comfort food being among her favorites. She recently went on a solo adventure to Charleston, and while at Folly Beach had the most amazing breakfast of her life: fried chicken, bacon and poached eggs nestled between syrup-drizzled pancakes. B is the younger brother of A, who worked at Centering on Children before him. He has nimble fingers - running the CNC machine that cuts our custom Shoebox lids every week. When he's not at COC he works with a local produce delivery company and gets to visit a variety of farms and reap the benefits of fresh excess organic produce. B is also deep into music, particularly the hip-hop and experimental varieties, and can be found playing out here in Asheville regularly. Get a sample of his music here: www.soundcloud.com/manukaru. Bucky has been at COC for almost 10 years, and has got to be its most enthusiastic and energetic employee we’ve ever had! He puts his attention to detail to work in assembling the bagged parts of the Tasks, and when he's done at COC he goes down the hall to sew koozies at Oowee Products. In his free time, Bucky expresses his creativity through painting at Open Hearts Art Space here in Asheville, enjoys hiking and being in nature, and gets some much-needed rest in his recliner. Jeffrey has been a task assembly master since 2015, and regularly lends his talent for photography and videography to various projects at COC. He also frequents a wide variety of local arts, cultural and activist events to document them with his camera, and his work has been featured in the Mountain Xpress, Hola Carolina magazine, and at the Smithsonian Migratory Bird Center. Jeffrey's other interests include films, Japanese culture and history, the natural world, hiking, acting, and poetry and screenwriting. Lorie has been a delightful addition to the COC crew. 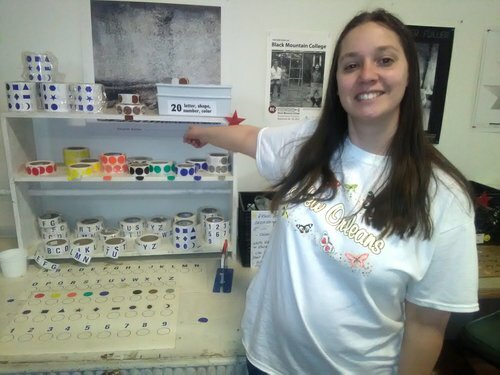 She specializes in assembling bagged parts (and especially likes putting the coins together for Task 20). She plays a very important role of maintaining quality control by ensuring that all of the bags we send out contain the correct pieces. When she's not at work, she fills her time with a variety of interests, including making polymer clay jewelry, raising and releasing caterpillars and butterflies (she's creating a butterfly garden with all of their favorite plants), fishing, watching videos about Sasquatch, and writing stories about benevolent gray aliens.